You are already registered for this event. Please log off and try a different account or go to your participant center. There is a problem retrieving participation types. Your email address may be in use by a Site Administrator. Please log off and try a different account. You are logged in as but don’t have a current session. Before updating your information, please confirm your identity with a fresh Login. There has been some problem with your registration. Please try again later. Please enter a Bake Sale name. Please enter a mobile phone number. By providing my mobile phone number, I agree that Share Our Strength may contact me on mobile phone. You may unsubscribe at any time. Please provide the date of your bake sale — if you know it. You can update this information with our team at any time. If you chose Other as a response above, please be more specific. 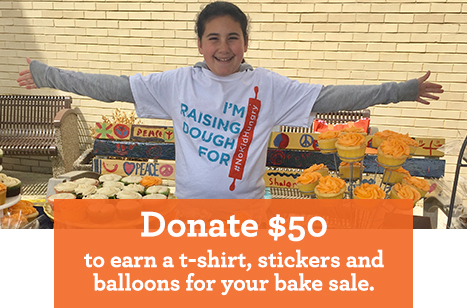 Make a personal donation to your bake sale to show supporters how committed you are. I understand that my execution of this Waiver is a prerequisite for participation in Bake Sale for No Kid Hungry. I further understand that there are risks and dangers inherent in handling, preparing, and selling food. I understand that in order to be allowed to participate in Bake Sale for No Kid Hungry, I agree to assume all risks and to release and hold harmless Share Our Strength and their affiliates, assigns, successors in interest, agents, servants, employees, officers, trustees and directors, past and present and each of them, sponsors, and volunteers, and all government and public entities including, but not limited to, the State, County and local municipalities where the events take place (collectively the “Released Parties”). I understand and agree that this release will have the effect of releasing, discharging, waiving, and forever relinquishing any and all actions or causes of action that I may have or have had on my own behalf and on behalf of my survivors, heirs and estate, whether past, present or future, whether known or unknown, and whether anticipated or unanticipated by me, arising out of my participation in Bake Sale for No Kid Hungry. This release constitutes a complete release, discharge and waiver of any and all actions or causes of action against the Released Parties. I understand that I am solely responsible for the safe preparation, handling, and sale of baked goods sold for Bake Sale for No Kid Hungry and I acknowledge that I am physically capable of participating in Bake Sale for No Kid Hungry. Further, I acknowledge that I am at least 18 years of age or have parental consent to participate. Should any portion of this Waiver be judicially determined invalid, voidable or unenforceable, for any reason, such portion of this Waiver shall be severable from the remaining portions herein and the invalidity, voidability, or unenforceability thereof shall not affect the validity, effect, enforceability, or interpretation of the remaining provisions of this Waiver. Please read and agree to the terms and conditions above. I Agree with the terms and conditions above.